The Louisiana Historical Museum opened their doors for the season on Saturday. 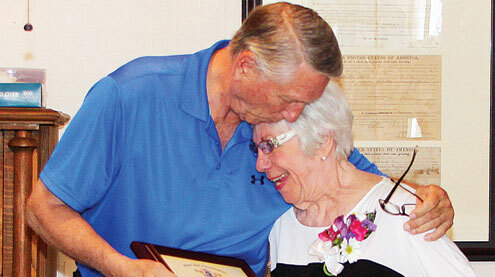 A special service was held to recognize Martha Sue Smith the the 25 years she has committed to the museum as its president. She and two others including Ned Glenn and Sally Cropp are original board members who started the museum from nothing. Now the building is full of local treasures and provides entertaining and educational programs throughout the summer. Above, State Rep. Jim Hansen offers a hug to Smith after presenting her with a resolution from the House of Representatives.